The Ghibli is an Italian word with its meaning best known to the Italians. Well, if we have to know the meaning of Ghibli we would have to get to an Italian translator. Or would have to bother Google. Regardless, the Ghibli means the hot dry wind from North Africa. And more than Italian, it is Arabic. Well, such titles are usually found on the Maserati cars. The Ghibli “Southern Dry Warm Wind” was introduced in 1967 as a grand tourer. It stayed in production for good nine years. And then it vanished from the screen. Soon in 1992, the Ghibli came out once again. But this time it was just a coupe. Touring was not a part of this car. And just after 5 years, the Ghibli went underground once again. 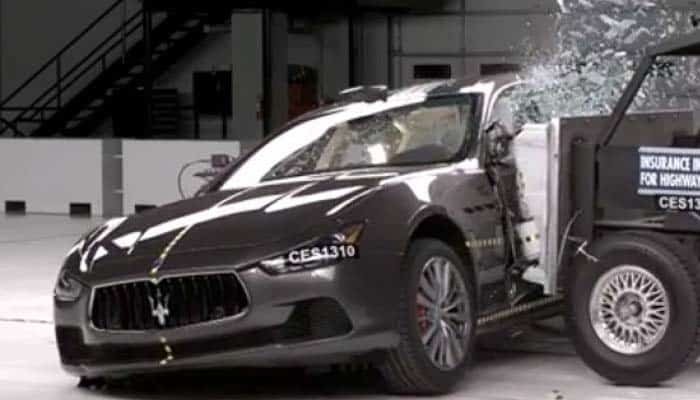 The archaeologist from Maserati did some digging and found the remains of Ghibli. This Libyan inspired hot wind was given a new shape. And in 2013, the Ghibli has reinvented once again. This time it was neither a grand tourer nor the coupe. Instead, this time it came out as an Executive Saloon. 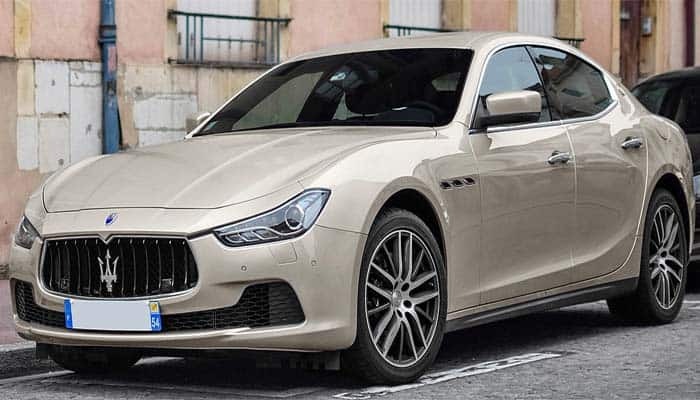 The Maserati said that Ghibli is the successor of the Biturbo 430 of 1986. Well, that is really vague. Because we think that the new Ghibli came in to replace the old Ghibli. Certainly, Ghibli in and Ghibli out. Well, the Maserati has some bright plans for the Ghibli. They eye on making it the finest selling four-door saloon for the company. But in the US market, the Ghibli ranks amid 11-15 among the premium sports sedans. The US market gets three models consisting the basic Ghibli worth $73,780, Ghibli S and the Ghibli S Q4. While the international market even gets a diesel version. The Ghibli is available with two drivetrains. The gasoline powertrain is divided into three trims. The base model is the standard Ghibli with 3.0 L V6 twin-turbo engine having 345 horses and 369 lb-ft of torque. And this is a rear-wheel-drive configuration. The Ghibli S gets the same engine with 404 horses riding at 406 lb-ft of torque. It even comes with a rear-wheel-drive configuration. Further, the Ghibli S Q4 gets the same power rating with the all-wheel-drive configuration. These three models are available for the North American and other markets. But the diesel powertrain is available in the rest of the world. 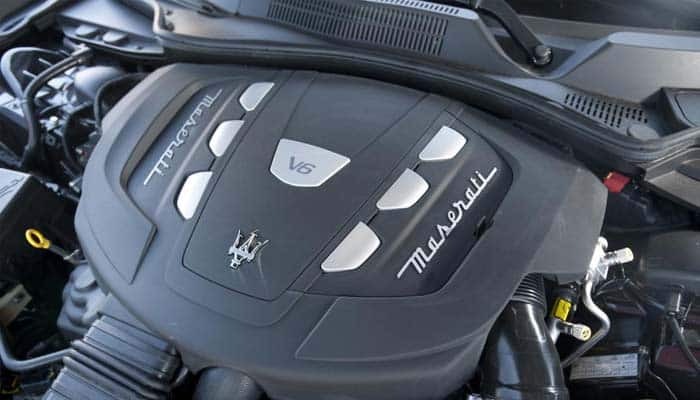 The Ghibli diesel comes with the 3.0 L V6 turbocharged engine. It is a rear-wheel-drive car and an upscale version of the Italian model. This powertrain has 271 horses to power this car. The Italian model comes has the same engine, but with lower tuning level. It has 247 ponies with 420 lb-ft of torque. And the diesel version is only available with the rear-wheel-drive configuration. Well, all of these Ghiblis ride with the 8-speed 8 hp ZF automatic transmission. Other than it, there is no manual transmission available in the lot. But this automatic transmission is not like a drowned donkey, making a lot of gap in managing torque. While the ZF helps Ghibli to balance each torque equally to provide a smooth flow to the car. The Q4s are really important for the Maserati. In a sales breakdown report, it was revealed that the Q4s get more customers than the rear-wheel drives. The poised handling, same mileage and enhanced steering ability make the Q4 famous. Well, we did not even feel the Q4s drinking more fuel than the rear wheels. They are quite same. The Ghibli resembles its siblings. But the Ghibli is a sedan, while its siblings are coupes and convertibles. The grille design, the sides and the rear are all pretty much similar. But the aerodynamic application is less on this car. The cosmetics are even the same. LED headlamps, fender vents and 19-inch wheels are common. The bumper gets the inert vents that throw in the air to the engine compartment. The large V6 engine gets an additional coolant to stay cool and calm. It is very much beneficial for the hot regions, where the radiators die out while cooling the engine. The interior ingredients are even similar to the other cars of Maserati. 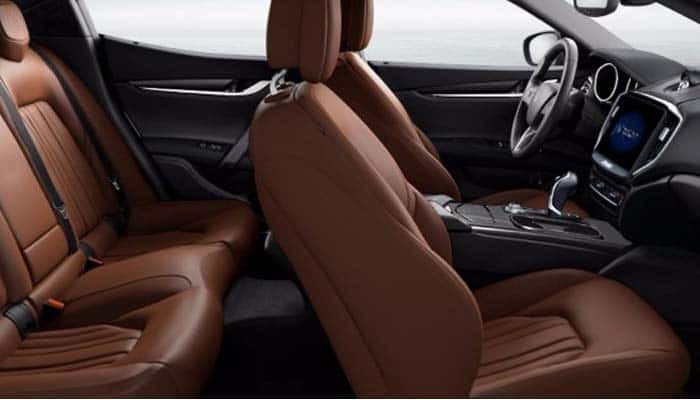 It gets the option for Zegna leather, plenty of stitching variants, carbon fiber and leather accents. Besides, there is plenty of space in this car. In a way, the seating is pretty comfortable. You would not feel like stuffed in the interior. As far as the luxury is concerned, Maserati has really done some cool job in making the interior glow. But you cannot really call it a fully luxury car. As it needs some more wood and premium leather to be counted among the world’s best. 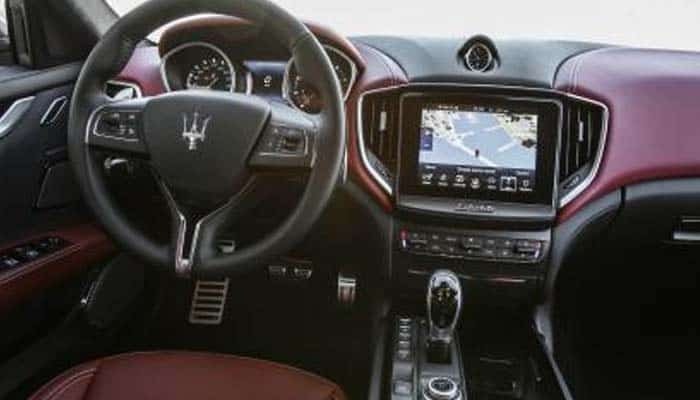 The Maserati Ghibli gets the 8.4-inch touchscreen infotainment system. It is an in-house developed system called the MTC+. Well, this MTC+ supports the Apple CarPaly and the Android Auto. Further, Siri is even available. Well, this MTC+ even provides the Wi-Fi facility through the 4G signals. In addition to all, the Ghibli comes with the 7-inch driver cluster with customizable options. The standard audio system is quite fine. But there is an additional option available for the Harman Kardon premium sound system with 12-speakers and 900-watt amplifier. And it could be upgraded to the 1,280-watt system. The passive safety in this car is fine. And it even secured a good result in its safety tests. Certainly, the occupants are very much safe in this car. Along with the passive safety, the Ghibli even includes the options for Advanced Driver Assistance System at an additional cost. The system includes highway assistance, lane keeping assist, traffic sign recognition, adaptive cruise control, forward collision warning system and the blind spot monitoring. The Ghibli is having a hard time in getting the impression in the American market. 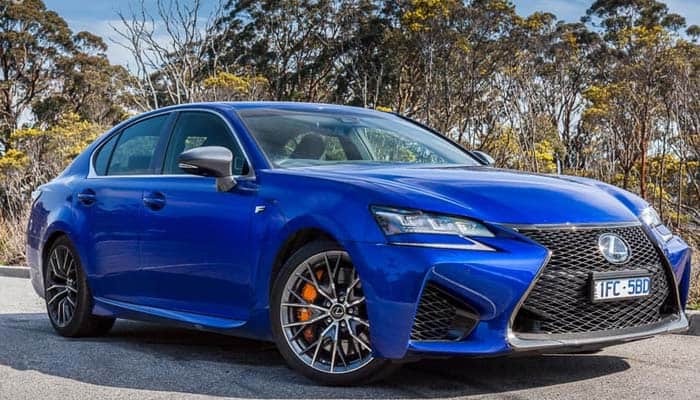 Well, it is because of some rivals of its class, such as the Lexus GS-F. The GS-F is mainly designed for the American market with sporty performance details. It is faster than Ghibli, but the design is pretty much same. 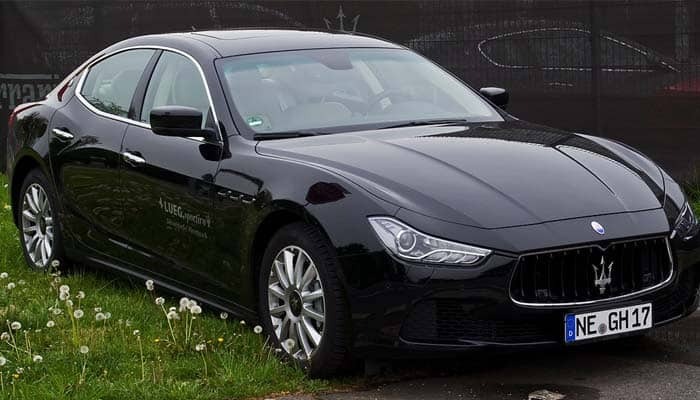 Well, Maserati Ghibli could not be an ideal option as there are plenty of cars available in this category. But still, it is not a bad car to choose.